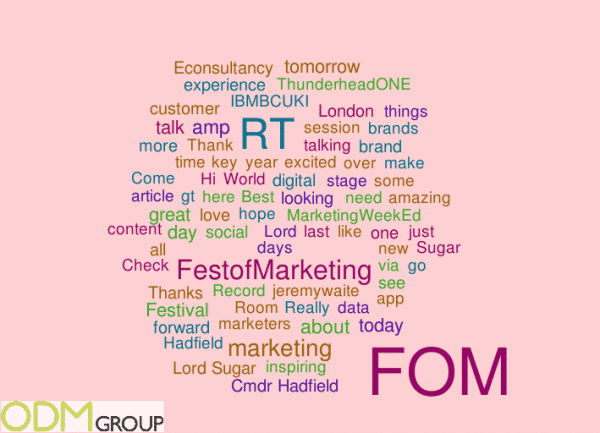 Festival of Marketing #FOM15 has recently finished and ODM has been tracking this event. This event was attended by thousands of marketers, brands and agencies to discover, shape, and celebrate the future of marketing. 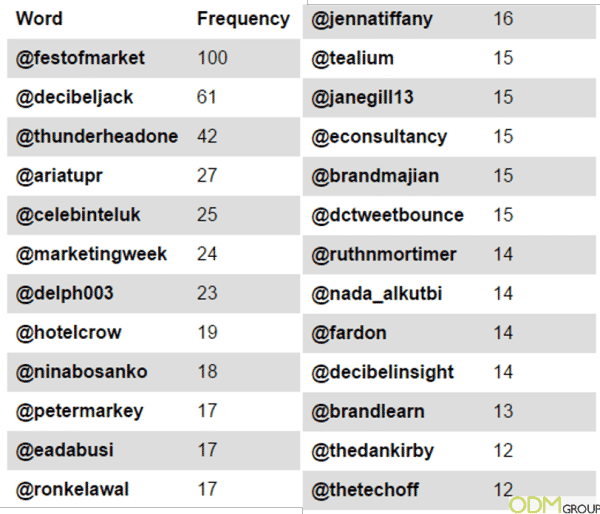 For this year’s Festival of Marketing, The ODM group followed the event closely and gathered information from over 4,000 tweets before and during the event. After analyzing this information we created the following word cloud, with the number of mentions being represented by the size of the word. As seen in the word cloud the big focus was on marketing, with interesting mentions of “Lord Sugar”, “Cmdr Hadfield” and “ThunderheadONE”. These word clouds are great at understanding what it is that attendees are talking about and what they find to be most interesting from this event, as can be seen here that the talks of Lord Alan Sugar and Commander Chris Hadfield to be particularly highly tweeted. The Festival of Marketing is a celebration of the vast and exhilarating marketing industry in all its glory. Each of the 12 stages at the Festival focuses on critical issues and practical insights so you’ll leave feeling smarter, refreshed and ready to take the marketing world by storm. It had an impressive line-up of household names, hard to reach CMOs and leading marketers, ready to inspire and impact the marketing journey, all sharing their hard-won insights and the secrets of their success. Plus, at the heart of the Festival this year were The Masters of Marketing Awards. The new awards programme championing the most creative, innovative and exceptional work and putting it centre stage. While the festival hosted the World’s largest Marketing lesson which became a Guiness World Record.